Being trendy can come at a high price. In the world of fashion, many people wear uncomfortable footwear to appear chic. In the tech realm, it’s common to purchase the newest smartphone – despite its terrible battery life – just to keep up with the changing times. And in the food world, trendiness often includes going to sketchy dives or holes-in-the-wall, many of which are of questionable cleanliness. A recent example of this phenomenon is the food truck movement. Food trucks are a good idea…in theory. In reality, however, many rely solely on fast methods of cooking such as deep-frying and use less-than-fresh ingredients. The Oaxacan Kitchen Mobile, however, defies all of my preconceptions about food trucks. 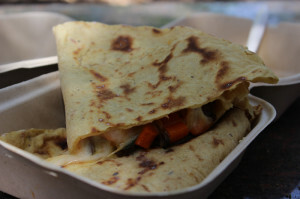 What started as a series of cooking classes and then became a restaurant in Palo Alto has now become a food truck that travels around the Palo Alto area. The Oaxacan Kitchen has been a long-standing vendor at the various farmers’ markets in the Bay Area. On many a Sunday morning, flocks of Palo Alto families and Stanford students alike can be found waiting in the massive line at the California Avenue farmers’ market to get a delicious Mexican brunch. The Oaxacan Kitchen offers a variety of options for breakfast, including chilaquiles, (tortilla chips drenched in salsa with many toppings), various tortilla dishes with poached eggs, breakfast burritos and huevos rancheros. When I get breakfast, I normally order a memela – a thick corn tortilla topped with black bean puree – and then add the seasonal veggies and a poached egg. It is topped with crumbly Mexican cheese, guacamole and green salsa. Every bite of this magical (and massive) memela offers a different texture, temperature and flavor, from the warm, runny egg to the cool, salty cheese to the tangy guacamole and tomatillo salsa. But to complicate the eternal brunch paradox, they also offer excellent lunch choices, from tacos to quesadillas to empanadas. Their empanadas are not what come to mind when one thinks of an empanada – they are much more like quesadillas on steroids. They are homemade tortillas stuffed with cheese and vegetables or chicken. What might be rather plain on its own is enhanced by the salsas – my favorite is the spicy, red one. 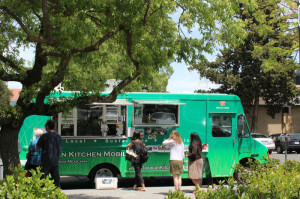 And, for Stanford students who really don’t want to leave the bubble to go across the street to the farmers’ market, the Oaxacan Kitchen Mobile can be found (usually once or twice a week) on campus for lunch or dinner. For a schedule of its whereabouts, check http://www.oaxacankitchenmobile.com. While there is about a five- to 10-minute wait time for the food, it is worth every second because it guarantees that the food is made on the spot, as opposed to sitting around for hours. This delicious Oaxacan fare tastes unlike anything I’ve ever had: it’s one trend that is all it’s hyped up to be.